It’s just eight days away from Day 30 of my weight-loss challenge — the end is near! I'm so close to my goal, and I can really see the changes now. Mostly, I can see the changes in my lifestyle. They (don't ask me who they are) say it takes 21 days to form a habit. I can truly say that I've formed some healthy habits over these past several weeks that I know I'm going to stick with once my challenge is over. Working out consistently for these past 22 days has been so great! Not only for my body but for my mind and spirit. Putting myself on the priority list along with the rest of my family members has really been good for me. My husband has been extremely supportive and helpful with the kids while I get my workouts in. No, I have not worked out every single day. Yes, there have been times when I cheated a little or haven't made the best choices. But I've still lost because I haven't given up. If I missed a workout day, I worked extra hard on the next sweat session. After a cheat meal, I made up for it with lots of water and more vegetables and lean proteins. Mostly, I've just kept at it. It seems the healthy stuff really does reside on the outskirts of the grocery store. I spend a lot less time in the center aisles of the grocery store these days. I buy lots of fresh fruits and vegetables, lean proteins and low-fat milk and cheeses for my family. It seems the healthy stuff really does reside on the outskirts of the grocery store. I've also had a lot of fun making simple healthy meals like turkey burgers, grilled chicken salads loaded with vegetables and my new favorite — turkey chili. 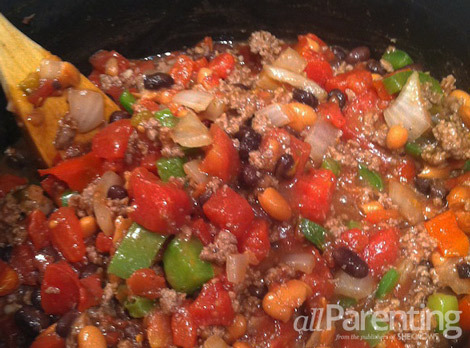 I researched a few recipes and created my own healthy chili chock full of veggies. It's filling, delicious and it makes me feel like I'm not on a diet. I hope you like it as much as I do. Sauté the onion and garlic for 2 to 3 minutes, then add the red and green bell peppers. Sauté until tender. Add the ground turkey (or beef) and cook through. Add the beans, tomatoes and chilies, jalapeños and all spices. Bring to a boil and then simmer for 30 to 45 minutes. If you prefer your chili a little thinner, you can add a little fat-free chicken broth. Warm and cozy for a healthy winter meal. Enjoy!